This first volume in the series (police, ambulance and fire & rescue services) provides fresh insights and management understanding of the changing role of policing against the backdrop of massive cuts in public expenditure experienced and the changing landscape of policing. The challenges of funding, training, online-crimes and cultural transformation are now felt globally. The need to learn and adapt from suitable models of police service delivery have never been greater. The book offers critical insights into the theory and practice of strategic and operational management of police services and the related professional and policy aspects. One of the highlight of this volume is to bring together scholarship using experts- academics, practitioners and professionals in the field, to each of the chosen topics. The chapters are based in the practical experiences of the authors and are written in a way that is accessible and suitable for a range of audiences. The editors are confident that this book will cater to a wider audience to inform policy and practice, both in the UK and internationally. This second volume in three book series (police, ambulance, fire & rescue services) provides fresh insights and management understanding of the changing role of the ambulance services against the backdrop of massive cuts in health budgets around the world and the changing context of pre-hospital care within the wider healthcare networks. The challenges of funding, training and cultural transformation are now felt globally. The need to learn and adapt from suitable models of ambulance service delivery have never been greater. The book offers critical insights into the theory and practice of strategic and operational management of ambulance services and the leadership needs for the service. One of the highlight of this volume is to bring together scholarship using experts- academics, practitioners and professionals in the field, to each of the chosen topics. The chapters are based in the practical experiences of the authors and are written in a way that is accessible and suitable for a range of audiences. The editors are confident that this book will cater to a wider audience to inform policy and practice, both in the UK and internationally. This book provides a critical understanding of contemporary issues within global society and how these relate to six case study examples (UK, USA, China, India, South Africa, Bangladesh, and Japan). The authors draw on their diverse experience to explore four major themes of contemporary relevance: overall aging of societies; governance and institutions; emergency services and public health provisions; and community activism and involvement. The key issues within the book–sociability, social capital, and community development–are examined in the context of an ever increasing aging world. The authors’ sense of optimism is linked to growing evidence that community activism is on the rise and can effectively plug the gap between public need and provision of service. Critical Perspectives in Emergency Services Management offers the first wide ranging critical assessment of the theory and practice of management, work and organization in contemporary emergency services. It focuses on the issues and challenges they face as they become more complex as the need to collaborate across geographical and service boundaries increases. The challenges of funding, training and cultural transformation in these important but neglected organisations are now being felt globally. The need to learn and adapt from suitable models of service delivery has never been greater. Academics and practitioners need to better understand the growing role and contribution of these services as well as finding ways to manage them better so that policy solutions to new and emerging threats may be developed and implemented. This edited volume is intended to help close the theory-practice divide and provide both communities with a better understanding of each other’s’ perspectives. This book is a timely review of the current blue light architecture and the integration drive of the UK government. It is our understanding that the ‘blue light integration’ project of the government is likely to succeed and facilitate greater degree of collaboration only if attendant issues surrounding differences in collaborative arrangements, organisational and professional cultures, leadership styles and trust and confidence issues are acknowledged and dealt with. The book aims to highlight some of the key issues and address some of these key themes in greater details. It is topical, timely and provides a critical academic scrutiny of the opportunities and challenges the emergency services face in the ‘new normal world’. It is aimed at the professionals, policy makes and academic scholars, having interest on the evolution of the domain of the emergency services in the UK in general and on integration of blue light services in particular. Granter, E., McCann, L., Wankhade, P., Hassard, J. and Hyde, P. (2018). Multiple Dimensions of Work Intensity: Ambulance Work as Edgework. Work Employment and Society (in press). Wankhade, P., Heath, G. and Radcliffe, J. (2017). Culture change and perpetuation in organisations: evidence from an English Ambulance Service. Public Management Review (in press). Available Here. Wankhade, P. and Miller, D. (2017). Emergency Management, Editorial, International Journal of Emergency Services, Vol. 6, No. 2. pp. 82-83. *Granter, E., McCann, L., Wankhade, P., Hassard, J. and Hyde, P. (2017). Keyed Up: Intensity in ambulance work. Work Employment and Society (2nd stage revision). Schedlitzki, D., Ahonen, P., Wankhade, P., Edwards, G. and Gaggiotti, H. (2017). Working with language: a refocused research agenda for cultural leadership studies, International Journal of Management Reviews, Vol.19, No. 2, pp. 237-257. Wankhade, P. and Miller, D. (2017). Emergency Management, Editorial, International Journal of Emergency Services, Vol. 6, No. 1. pp. 2-3. Andrews, R. and Wankhade, P. (2016). Regional Variations in Emergency Service Performance: Does Social Capital Matter? Regional Studies, Vol. 49, No. 12, pp. 2037-2052. Wankhade, P. (2016). Staff perceptions and changing role of pre-hospital profession in the UK ambulance services: an exploratory study. International Journal of Emergency Services, Vol. 5, No. 2, pp. 126-144. Wankhade, P. and Miller, D. (2016). Emergency Management, Editorial, International Journal of Emergency Services, Vol. 5, No. 2. pp. 106-109. Wankhade, P. and Miller, D. (2016). Emergency Management and Organisational Resilience, Editorial, International Journal of Emergency Services, Vol. 5, No. 1. pp. 3-5. Halsall, J.P., Wankhade, P. and Cook, I.G. (2015). Global Perspectives on Volunteerism: Analysing the role of the State, Society and Social Capital, International Journal of Sociology and Social Policy, Vol. 36, No. 7/8, pp. 456-468. Wankhade, P. (2015). Emergency Management and Organisational Resilience, Editorial, International Journal of Emergency Services, Vol. 4, No. 2. P. 4-6. Wankhade, P. and Shankaran, S. (2015). Emergency Management and Organisational Resilience: Editorial, International Journal of Emergency Services, Vol.4, No. 1. p. 4-9. Wankhade, P., Halsall, J.P., and Cook, I.G. (2015). The British big society effect: the challenges of the third sector, International Journal of Sustainable Society, Vol.7, No.4, pp.309-321. Wankhade, P. and Brinkman, J. (2014). The negative consequences of culture change management: evidence from a UK NHS ambulance service, International Journal of Public Sector Management, Vol. 27, No. 1. pp. 2-25. Heath, G. and Wankhade, P. (2014). A Balanced Judgement? : Performance Indicators, Quality and the English Ambulance Service; some issues, developments and a research agenda. The Journal of Finance and Management in Public Services, Vol. 13, No. 1, pp. 1-17. Wankhade, P., Murphy, P. and Greenhalgh, K. (2014). Editorial, International Journal of Emergency Services, Vol. 3, No. 2. pp. 4-5. Wankhade, P., Murphy, P. and Greenhalgh, K. (2014). Editorial, International Journal of Emergency Services, Vol. 3, No. 1. pp. 4-5. Wankhade, P., Cook, I. G. and Halsall, J.P. (2014). Ethnic Minorities and their Health Needs: Crisis of Perception and Behaviours, Illness, Crisis and Loss, Vol.22, No. 2, pp. 145-158. Halsall, J.P., Wankhade, P. and Cook, I.G. (2014). The Big Society Debate: Is it a Panacea for Reducing the Impact of Welfare Cuts in Public Health?, World Journal of Social Sciences, Vol. 4. No. 1. pp. 167–175. Wankhade, P. (2013). Facing the Future: Latest Fire and Rescue Services Reforms Proposal- Time for a real debate? Emergency Services Times, Vol. 14, No. 2, pp. 18-19. (June, 2013). 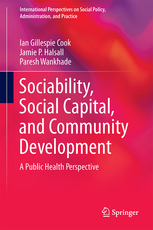 Halsall, J., Cook, I. G. and Wankhade, P. (2013). Understanding Community Governance: A Global Perspective, International Journal of Asian Social Science, Vol. 3, No. 5. pp 1112-1127. Halsall, J. P., Wankhade, P. and Cook, I. ( 2013).The Big Society in a Time of Crisis – the Impact on Public Health, Illness, Crisis and Loss, Vol. 21, No. 4. pp. 341-353. Wankhade, P. (2012). Different cultures of management and their relationships with organisational performance: evidence from the UK ambulance service, Public Money & Management. Vol. 32, No.5. pp. 381-388. Wankhade, P. and Barton, H.(2012). Conceptualising a Police Performance Framework in an Era of Financial Constraint, Policing Today, Vol. 18, No. 3, September 2012. pp. 44-46. Wankhade, P. and Murphy, P. (2012).Bridging the theory and practice gap in emergency services research: case for a new journal, International Journal of Emergency Services, Vol.1, No. 1. p. 4-9. Wankhade, P. and Murphy, P. (2012). Editorial: International Journal of Emergency Services, Vol.1, No. 2. pp.108-110. Wankhade, P. and Barton, H.(2012). Police Performance Framework: a Model. Policing Today, Vol. 18, No. 4, p. 41, December 2012. Wankhade, P. (2011). Performance measurement and the UK emergency ambulance service: Unintended Consequences of the ambulance response time targets, International Journal of Public Sector Management, Vol. 24, No. 5. pp. 382-402. Wankhade, P. (2011). Emergency Services in Austerity: Challenges, Opportunities and Future Perspectives for the ambulance service in the UK, Ambulance Today, Vol.8, No. 5. pp. 13-15. Heath, G., Radcliffe, J. and Wankhade, P. (2018). Performance management in the public sector: the case of the English ambulance service, in Harris, E. (eds.) The Routledge Companion to Performance Management and Control, pp. 417-438, Routledge: London. Wankhade, P. and Cook, I.G. (2016). A Model for Change: Sharing Ideas and Strategies. In Halsall, J.P. and Snowden, M. (eds.) The Pedagogy of the Social Sciences Curriculum, Springer: US. Wankhade, P., Radcliffe, J. and Heath, G. (2015). Culture of management in ambulance services: Issues, challenges and opportunities in Wankhade, P. and Mackway-Jones, K. (eds.) 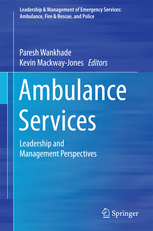 Ambulance Services: Leadership and Management Perspectives, Springer: New York. Wankhade, P. and Mackway-Jones, K. (2015). Setting the Scene: Management of Emergency Ambulance Services: Introduction to the Volume in Wankhade, P. and Mackway-Jones, K. (eds.) Ambulance Services: Leadership and Management Perspectives, Springer: New York. Wankhade, P. and Weir, D. (2015). Setting the Scene: Management in modern Policing: Introduction to the Volume. in Wankhade, P. and Weir, D. (eds.) Police Services: Leadership and Management Perspectives, Springer: New York. Weir, D. and Wankhade, P. (2015). Future perspectives in Policing. in Wankhade, P. and Weir, D.(eds.) 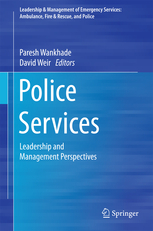 Police Services: Leadership and Management Perspectives, Springer: New York. Wankhade, P. and Brinkman, J. (2011).Dilemmas of ambulance professionals in attending to an emergency within eight minutes: The ethics of target setting in Weir, D.T.H and Sultan, N. (eds) From Critique to Action: the practical ethics of the organisational world , Cambridge Scholars, Newcastle –Upon-Tyre, pp. 106-129. Wankhade, P., Radcliffe, J. and Heath , G. (2016). Coordination of Emergency Services and the Problem of Governance: A UK Perspective. European Academy of Management (EURAM) 2016 Conference, University Paris-Est Créteil (UPEC), Paris, France. 1 June – 4th June 2016. Wankhade, P., Halsall, J. and Cook, I. (2016). Volunteerism in the age of austerity: an international perspective. European Academy of Management (EURAM) 2016 Conference, University Paris-Est Créteil (UPEC), Paris, France. 1 June – 4th June 2016. Wankhade, P. (2015). Let us Learn: The Curious Case of Ambulance Performance Management. Public Management & Governance Track, British Academy of Management Conference, University of Portsmouth, UK. 8th-10th September 2015. Wankhade, P. (2015). The Logic of Target Setting: Case of Ambulance Performance Management System. International Research Society for Public Management Conference, University of Birmingham, UK. 30th March -1st April 2015. Wankhade, P., Heath, G. and Radcliffe, J. (2015). Cultural perpetuation analysis in the emergency ambulance services in the UK: Implications for international practice. European Academy of Management (EURAM) 2015 Conference, University of Warsaw, Poland. 16h June – 20th June 2015. Wankhade, P., Weir, D. and van Bunt, S. (2015). Servant-Leadership in Times of Crises and Emergencies and Disasters: A Critical Perspective. European Academy of Management (EURAM) 2015 Conference,University of Warsaw, Poland. 16h June – 20th June 2015. Wankhade, P. (2014). Exploration and implications of the long work patterns in the UK National Health Service (NHS): an emergency health perspective. European Academy of Management (EURAM) 2014 Conference, University of Valencia, Spain. 4th June – 7th June 2014. Wankhade, P. and Andreoni, V. (2014). Voluntary participation and social capital: the mediating role of economic growth. European Academy of Management (EURAM) 2014 Conference, University of Valencia, Spain. 4th June – 7th June 2014. Wankhade, P., Halsall, J.P. and Cook, I. (2014). Ambulance service and health inequalities: an exploratory study. Teaching Public Administration – Public Administration Committee (TPA-PAC) Conference,University of Liverpool, UK. 9th June – 11th June 2014. Halsall, J. P., Wankhade, P. and Cook, I. (2014). The British Big Society Effect: The Challenges of the Third Sector. The British Sociological Association (BSA) Annual Conference, Leeds, UK. 23rd April – 25th April 2014. Wankhade, P., Halsall, J.P. and Cook, I. (2014). The Influence of Sociability, Social Capital, and Community Development on Public Health, Asia-Pacific Social Science Conference, Seoul, South Korea. 8th January – 10th January 2014. Wankhade, P. (2013). An ethnographic exploration of the ambulance personnel: adrenalin junkies or health professionals? The 8th International Critical Management Studies Conference, University of Manchester, UK. 10th July – 12th July 2013. Wankhade, P. (2013). Performance Framework for ambulance service in the era of austerity: lessons and implications for the future, Public Administration Committee Conference, Edinburg University, UK. 9th September – 11th September 2013. Schedlitzki, D., Ahonen, P., Edwards, G., Gaggiott, H. and Wankhade, P. (2013). Leadership and language: a research agenda, 29th European Group for Organizational Studies (EGOS) Colloquium, Montreal, Canada. 3rd July – 6th July 2013. Barton, H. and Wankhade, P. (2013). Occupational sub-cultures and its link to organisational performance in the emergency services: A comparative account of ambulance & police services in the UK, British Academy of Management Conference, University of Liverpool, UK. (Public Management & Governance Track). 11th September – 13th September. Wankhade, P., Cook, I. and Halsall, J.P. (2013). Ethnic Minorities and their Health Needs: Crisis of Perception and Behaviours, Paper to be presented at the Medical Sociology Group Annual Conference, British Sociological Association, The University of York, UK. 11th – 13th September 2013. Halsall, J., Cook, I. Oberoi, R. and Wankhade, P. (2013). The Evolving Role of Community Governance: Case Studies of the UK and India, Healthy Communities; Hopeful Places: In Defence of Planning, Paper to be presented at the UK-Ireland Planning Research Conference, University of West of England, UK. 11th September – 13th September 2014. Halsall, J. P., Wankhade, P. and Cook, I. (2013). The Big Society debate: panacea for reducing the impact of welfare cuts in public health?, 6th International Business and Social Science Research Conference, Dubai. 3rd January – 4th January 2013. Wankhade, P. and Barton, H. (2013). Exploring and examining the empirical link between occupational sub-cultures and organisational performance in the emergency services, European Academy of Management (EURAM) 2013 Conference, Galatasaray University, Istanbul, Turkey. 26th June – 29th June 2013. Barton, H. and Wankhade, P. (2013). Operationalizing a police performance management system, Production and Operations Management Society (POMS) 2013, Twenty Fourth Annual Conference, Denver, Colorado, U.S.A. 3rd May – 6th May 2013. Wankhade, P. (2012). Emergency Services & Praxis, Symposium Chair, British Academy of Management Conference, Cardiff University, UK (Public Management & Governance Track). 13th September – 15th September 2012. Wankhade, P. and Barton, H. (2012). Measuring police performance during austerity: a conceptual framework, paper presented at British Academy of Management Conference, Cardiff University, UK (Performance Management track). 13th September – 15th September 2012. Wankhade, P. (2012). Interoperability amongst emergency services: Issues, opportunity and challenges, Paper being presented at the Public Administration Committee Conference, University of Plymouth, UK. 18th July – 19th July 2012. Wankhade, P. (2012). What managers really do: understanding middle management’s strategic role in the UK emergency ambulance service, Paper being presented at the Public Administration Committee Conference, University of Plymouth, UK. 18th July – 19th July 2012. Barton, H. and Wankhade, P. (2012). Conceptualising a Police Performance Management System in an Era of Financial Constraint, Paper being presented at the Performance Management Association (PMA) 2012 Conference: From Strategy to Delivery, Fitzwilliam College, University of Cambridge, UK. 11th July – 13th July 2012. Wankhade, P. and Brinkman, J. (2011). Public leadership in the era of austerity: Challenges and opportunities in the English NHS emergency ambulance services, Paper presented at the 13th Annual International Leadership Association (ILA) Global Conference, One Planet, Many Worlds: Remapping the Purposes of Leadership, London, UK. 26th October – 29th October 2011. Wankhade, P., O’Siochru,C. and Brinkman, J. (2011). Leadership behaviour in the Small and Medium Size Enterprises: Evidence from the UK, Paper presented at the British Academy of Management Conference, Ashton University, UK. 13th September – 15th September 2011. Andrews, R. and Wankhade, P. (2011). Social capital and emergency service performance: Evidence from NHS ambulance trusts, Paper presented at the British Academy of Management Conference, Ashton University, UK. 13th September – 15th September 2011. Phillips, J., Wankhade, P., Fisher, A., and Weir, D.T.H. (2011). The double helix of transactional and transformational leadership: comparative case-study of blended leadership in the UK emergency response services, Paper presented at the British Academy of Management Conference, Ashton University, UK. 13th September – 15th September 2011. Barton, H. and Wankhade, P. (2011). Police reforms: Is the High Performance Police System (HPPS) model a way forward? Paper presented at thePublic Administration Committee Conference, University of Birmingham, UK. 5th September – 6th September 2011. Heath, G., Radcliffe, J. and Wankhade, P. (2011).In the Balance? Performance Measurement and the English Ambulance Service: some issues and developments, Paper presented at the Public Administration Committee Conference, University of Birmingham, UK. 5th September – 6th September 2011. Wankhade, P. and Brinkman, J. (2010). Redemption through Reframing: How Police officers and Emergency Ambulance Staff explain themselves: A UK perspective, Paper presented at the Academy of Management Meeting, Montreal, Canada. 4th August – 5th August 2010. Wankhade, P. and Brinkman, J. (2010). The unintended outcomes of culture management initiatives: Evidence from a UK Emergency Response Service, Paper accepted at the Organizational Studies Track, British Academy of management Conference, The University of Sheffield, UK. 14th – 16th September 2010. Wankhade, P. (2009). Performance measurement and the UK emergency ambulance service: Unintended Consequences of the ambulance response time targets, Paper presented at the Public Administration Committee Conference, Glamorgan University, 7th – 9th September 2009, UK. Wankhade, P., Brinkman, J. and Weir, D.T.H. (2009). Halfway down the pier and looking for a place to jump: Organisational subcultures and service delivery in emergency services, Paper presented at the Organisational Studies Track, British Academy of Management Conference, Brighton Centre, Brighton, UK. 15th September – 17th September 2009. Wankhade, P. (2009). Exploration of relationship between organisational culture and performance in emergency health services: an ethnographic perspective of an NHS ambulance service; Paper presented at the 2nd Symposium on Current Developments in Ethnographic Research in the Social and Management Sciences, 6-7 September 2007, Keele University, UK 2009 (Cited in Radcliffe, J. and Heath, G. (2009), “Ambulance calls and cancellations: policy and implementation issues”, International Journal of Public Sector Management, Vol.22, No.5, pp.410-22). Wankhade, P. (2008). Evaluation of the organisational capacity and service delivery model in a healthcare organisation: Evidence from an ethnographic case study in an English NHS Ambulance Trust, Paper accepted at the Public Management in Practice Panel, XII Annual Conference of the International Research Society for Public Management (IRSPM) Conference, Queensland University of Technology, Brisbane, Australia. 26th March -28th March 2008.